Before leaving for the weekend, let me highlight some recent additions to RevitLookup by Håvard Leding of Symetri. 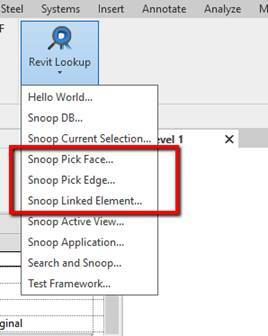 I added and tested the new commands in RevitLookup release 2019.0.0.6. Below is the description and some additional background information in Håvard's own words. Many thanks to Håvard for implementing and sharing this! This is perhaps something of interest to someone. RevitLookup is brought to you by Jeremy Tammik and friends. It's free and open source.